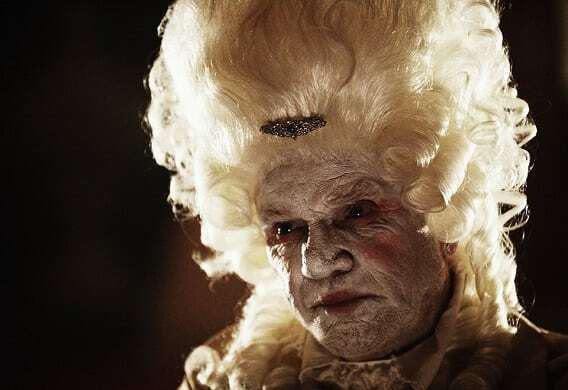 Dr Stenson (Malcolm McDowell) introduces the viewer to his sanitarium, where we meet three patients and discover exactly how they ended up locked away in a mental asylum. The first tale of Sanitarium depicts the life of Gustav (John Glover), a talented but troubled artist who spends his time creating Tim Burton-eque models and features them in a gallery, ran by curator Sam (Robert Englund). After the enormous success of his exhibitions, New York calls with an offer to buy his collection but what will he decide? The second segment focuses on schoolboy Steven (David Mazouz), who keeps seeing a strange, black hooded figure, lurking around home and school. With an abusive homelife and struggling education, things come to a head for the young boy. The final episode centres around research lecturer James Silo (Lou Diamond Phillips), who teaches his students about the Mayan’s prophecy of the world ending on 21st December 2012. Much to his wife’s concern, James believes the prediction wholeheartedly and devotes the remainder of his days to planning a way to survive the ‘apocalypse’. 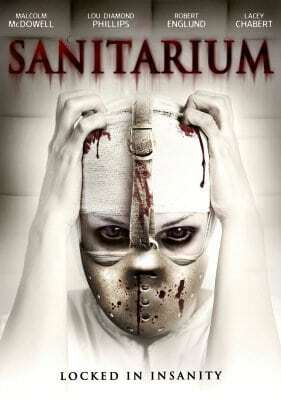 Sanitarium is one of the latest titles in the reignited horror anthology genre, but unlike V/H/S, The Theatre Bizarre and others of their ilk, Sanitarium takes a somewhat classic horror approach, with the scares being much more subtle and mentally disturbing rather than blood splattered across the screen. The first two episodes of the film I rather enjoyed with their varied, freaky tales of inner torment. John Glover as Gustav, with his dreadlocked hair and unkempt appearance, is quite likable in his own quirky way though his artwork is rather disturbing to say the least. The supporting characters bounce off Gustav well and the story surrounding him is in intriguing one. David Mazouz, who plays Steven in the second episode, is quite cute with his curly hair and glasses, and you genuinely feel sorry for this lonely little boy who, each night, has to go home and do chores for his single parent father, who treats him like dirt and abuses him if he does something wrong. The mysterious figure which Steven sees reminds me of Michael Myers in Halloween. The hooded creature appears and disappears rather quickly and only seems noticable to Steven, much like the boogeyman was to Laurie Strode in the horror classic. The third, whilst an interesting and almost-current concept, drove me a bit insane as it didn’t convey its story as coherently as the rest, though it could have been intentional to replicate James’ state of mind. The great thing about this anthology is that each episode retains a tone which they are all bound to. Never does one episode try to outdo the other, with all segments telling a unique story of personal horror. If I was to compare it to another, I’d say it was more akin to The Theatre Bizarre than V/H/S with a gentler approach. The cinematography, sound and performances are all quite tasteful for the project at hand and not once do the characters become bigger than the story they’re in. Even though the film features big stars, its more obscure actors perform as good a job as they do with their characters, working perfectly alongside one another. A light-hearted horror anthology, Sanitarium is a great Saturday night viewing for those evenings when you don’t want something too heavy to give you nightmares, but enough to give you the willies.